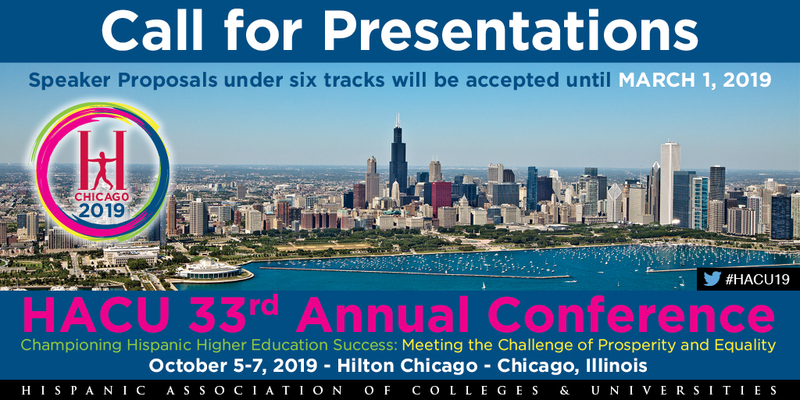 The Hispanic Association of Colleges and Universities has announced the Call for Presentations for its 33rd Annual Conference, October 5-7, 2019, at the Hilton Chicago, Illinois. Speaker proposals will be accepted until March 1, 2019. Presentations can be submitted individually or in groups. Submissions for roundtable presentations are encouraged. Apply by March 1. Notification of proposal acceptances will be sent on March 22. Detailed guidelines on the submission process are available online, click here. The Hispanic Association of Colleges and Universities (HACU) represents more than 480 colleges and universities committed to Hispanic higher education success in the U.S., Puerto Rico, Latin America and Spain. For more information, visit www.hacu.net.